I’ve had the same blanket on my bed since I was 7 or 8 years old. I know this sounds crazy…how does this work? I had a twin when I was a kid and I have a queen size bed now. But it still fits…barel enough to cover just the top of the bed. I use it as a cover over the sheet but below the duvet. 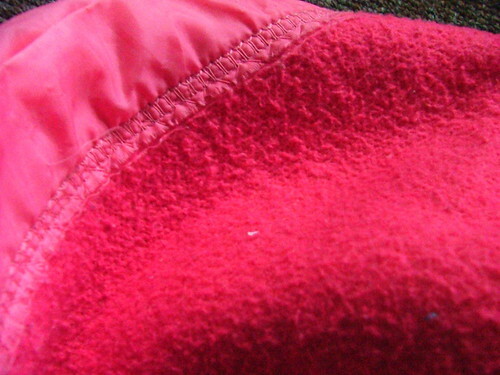 One may wonder why I still use the same blanket from childhood…it must be worn thin, right? But somehow it’s the one blanket I always end up wrapped in and it keeps me warm. Sadly, a few weeks ago I noticed that pieces are starting to rip off. Almost like a thread in a sweater, it’s slowly pulling apart. I’m not sure what I’ll do when it’s all gone. Maybe if I ever have kids I’ll keep enough of it to use as a baby blanket.